Footscray captain Jordan Russell will lead the charge in his debut state game as the VFL guns for its first win against archrivals SANFL since 2002. 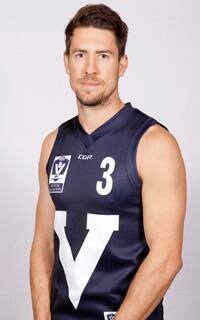 “It’s an honour, and it’s quite unexpected with a lot of VFL skippers in the side,” said Russell. “On the day, leadership isn’t going to fall to one or two people, it’s going to fall everyone, and that’s the great thing about it. Lauchlan Dalgleish and Will Hayes join Russell as the other Footscray representatives in the side. Box Hill captain David Mirra has been named as the team’s vice-captain. On the nous and experience of his deputy in this year’s game, captain Russell says Mirra’s record speaks for itself. The state squad currently sits at 25, with a final 22 plus emergency to be named Thursday night at training.